Billed as The Birds meets Outbreak, Virus Undead, aka Beast Within is definitely for the birds. And it’s no break out hit for director Wolf Wolff, at least in the opinion of this reviewer, Chris Chriss. It’s more Birdemic-ally inclined. 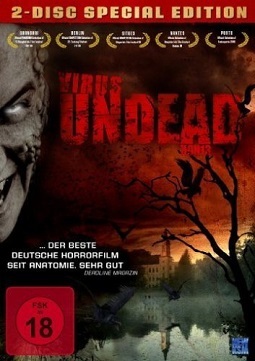 Virus Undead is blue as blue can be, or “sehr blau,” washing out the German countryside and giving it a drab sameness that off-the-bat, relegates this to horror tedium/obscurity/purgatory. The plot’s fairly straightforward: An aged researcher dies on his castle estate, killed by birds. Media erroneously reports that he succumbed to Alzheimer’s. His grandson, doomed to living in the shadow cast by this giant in the field of biology, and a group of friends, go over to the deceased’s pad to clear out his belongings and naturally, to party (as it’s a cool big ol’ house). En route on a booze run, they pick up some girls at the local gas station and invite them along. They then get into a rough patch with a townie goon and his buddy – luckily for them – soon interrupted by a donut-munching member of the constabulary. It should be said that while this is clearly a German production with German actors, and German cultural signposts (a snack bar is an “Imbiss”), they all speak in slightly off idiomatic Americanisms. For example, when one of the peckish dudes gets to the old house, he orders takeout asking directory assistance for “fast food delivery” options in the area. Nobody, and we mean nobody, uses the term “fast food” unless it’s in a pejorative sense. Certainly not with respect to a night’s dinner choices. Still, a mostly capable German cast speaking English can’t be faulted for the mess that surrounds them. The old house seems to lack electricity, at least minus the sparks created when the two girls pair up with the two guys, leaving their poor friend, dorky med student Eugene, to his own devices. The weirdo outcast finds a gun on the property and goes out to shoot bottles in the woods. He accidentally shoots a fanged creature instead. The goons return with a score to settle, and they’re sporting weird rashes and behaving even more aggressively than even your average goon. The entire group soon find out that there’s bigger fish to fry, or, er…in this case a disease that’s being passed from birds, causing bodies to re-animate. And they have to do whatever it takes to survive. This reviewer didn’t survive until the end of Virus Undead, or Beast Within. So you’ll have to accept the above, a synopsis of the first interminable 64 or so minutes. This entry was posted in Horror and tagged body horror, Movies from the 2000s, terrible movies by Really Awful Movies. Bookmark the permalink.